Sometimes, we all get a little stressed and feel that we are literally going to explode from all the pressures we are under. Work deadlines, seeing family and friends, trying to fit a social life in, trying to keep fit and healthy - it's not easy balancing everything. 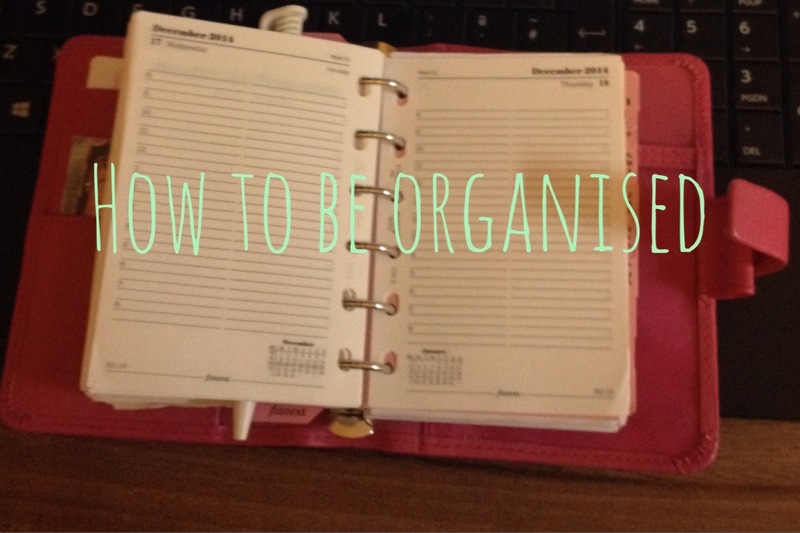 I'm pretty OCD when it comes to organisation, and so I thought I would do a quick post giving my top tips on how to stay organised. I hope you enjoy! Whether you make a schedules in your diary/Filofax as I do, or whether you choose to write it on a post it note or scrap of paper - schedules are miracle workers when it comes to organising your life. The night before, I write down in my diary all of the commitments and things I must do the next day. Rather than spending an hour or so like a headless chicken rushing around trying to fit everything in, or apologising for missing something like a class because you had 101 other things on your mind, make a schedule and stick to it. Crossing something off is satisfying, so trust me - you will stick to the schedule! Writing down time deadlines for projects and seminar and lecture times or meeting times or whatever, is also important, because then you know where you have to be and when. As well as a schedule, lists are a great way of organising your life. I literally have about 15 notes in my phone, all dedicated to different lists. But it really does save time, meaning you have more time to be getting on with other things at a later date. If I see inspiration for Christmas presents, I add it to the 'Christmas List'. I know when I go to do my Christmas shopping, I will sit down in front of my laptop and probably have it done within an hour. Lists are also good for managing uni reading. At the beginning of a week, I make a list of all the reading to be completed for that week. I then look at my timetable to see when my seminars are, and then I schedule my reading in (so much per day) to ensure I get it all completed before my seminar. If your reading requires books from the library, when you make your list you can write the library number next to it, so when you happen to be at uni next you can grab your week's books in advance of everyone else, and it means that you don't get sat at home ready to work, and realise that all of your reading needs to be done for the next day, and all the books you need are at the library/ already taken. It means you can spread your reading out effectively throughout the week, ensuring you have spare time each day to eat, sleep, socialise, do paid employment, or whatever. I've only been back at uni for 3 weeks, but I already know that my flatmate has Thursdays and Fridays off. I know that my Mum has every other weekend off work. These are all examples of getting to know your family and friends schedules, which is important when organising your life. I'm not saying go mad and learn every detail of what they are doing and when and where. But because I know my flatmate is off on Thursdays and Fridays, I often leave some space free in case we want to grab a coffee, lunch out or shopping or something. Because I know my Mum has every other weekend off, I try to plan going home around these commitments. It means that you can have a social life around work/uni/school. Because if you save all your work for when your friends are free, then you won't really have much of a social life, and won't see the people who make you happy and give you that healthy balance in life. Some people think eating out is a waste of money. Personally, it is one of my favourite things to do in the world, so this isn't a problem for me. If you know you have a lot of work on, sometimes it can be hard to fit in seeing friends or family. Ultimately though, we all have to eat. Three times a day. So if I feel I've neglected someone lately, I arrange to meet up with them for brunch, lunch or dinner. I was going to take that break anyway, so why not make it a nice one! If you don't like eating out or would rather save money, invite them round and offer to cook for them. They will love the gesture, and you were probably going to cook for yourself anyway! I hope you found these tips useful! How do you organise your life? Do you have any top tips? Great post, thanks for sharing these tips! !